I was visiting my mother-in-law (hi, Bev), who went out and bought an iMac while I was there. She got the smaller 20" version. I'd seen these before in the Apple Store, and they are nice, but I'd never used one or was interested in them. Well color me impressed. These things are great fun to use. She'd told me she was in the market for a new Mac. I knew she had a G4 Mac mini and a white G3 iBook. I pictured her getting a new MacBook like I recently wrote about or maybe upgrading to a MacBook Pro. I brought my MacBook to show her how nice it is. When she told me that it was the iMac she wanted, I was surprised. Then she informed me that she doesn't want the portability and was interested in a better computer for her office. Now I think Apple has done a great job with their MacBook line. It can act as a desktop replacement as long as you're not a power user, and as a replacement for her aging G4 Mac mini and iBook, I thought the MacBook more than powerful enough. She had already made up her mind, and I went along with her to the Apple Store to help her bring it home. At the Apple Store it's easy to forget that 20" is a darn nice monitor. I ran these numbers through my head, comparing it to my brand new MacBook, the larger monitor size, the other features like processor speed, and the comparable low price. I started to understand the reason she wanted one. Once you get one of these on its own, away from the store where it is just ordinary and to your house, where you may have a 15"-19" LCD monitor (or worse, a clunky CRT monitor), it starts to shine. The migration of files was simple. We ran the Migration Assistant, and everything transferred over perfectly. I wasn't sure about Entourage or Quicken, since they aren't Apple products, but they transferred as well. I used FireWire mode for faster transfer. One problem was getting a FireWire 6-pin to 6-pin cable. You can buy a FireWire cables anywhere - Office Max, Radio Shack, etc. - but all of them sell the 6-pin to 4-pin for use with video cameras. I learned that FireWire transfer is a Mac-only deal, and we had to go back to the Apple Store to buy a cable. So if you do upgrade, make sure you have one or buy it at the store before leaving. The old Mac mini was set up briefly as a headless computer. It could have been left that way or even used as a spare hard drive for doing Time Machine backups. Instead, the Mac mini was passed on to someone else to use. The great thing about Macs is the continuing usefulness of the older models: Better than any recycling plan that finds the best way for disposing of them, is to share a Mac with a friend or relative. At this point in the trip, my son had been using a laptop to surf the Web. Once the iMac was up and running, he'd sneak off to use it instead. He thought the large monitor was awesome. for email, web surfing, and photo editing, this computer has power to spare with no delays running these tasks. When more family showed up, we set up a video chat session between the iMac in one room and my MacBook in the kitchen. The kids had a blast goofing off and making faces. So while these are not your typical benchmarks scores to decide which computer to buy, I can say that the iMac is a lot of fun to use (your mileage may vary). 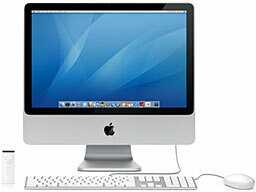 Next time you're in the market for a new computer, check out the iMacs. You may find them to be more than enough computer for your everyday use.